Cuisinart wins for the fifth year in a row. This post was done in partnership with Wirecutter. When readers choose to buy Wirecutter's independently chosen editorial picks, Wirecutter and Engadget may earn affiliate commission. 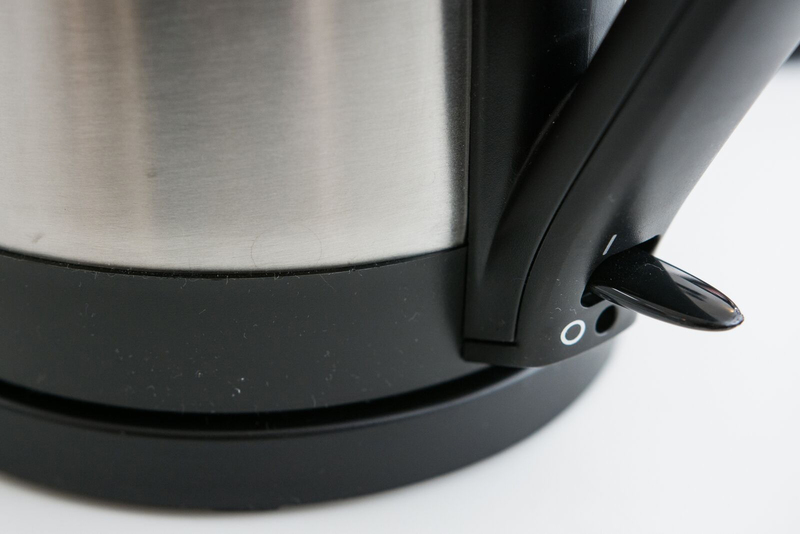 Read the full electric kettle guide here. 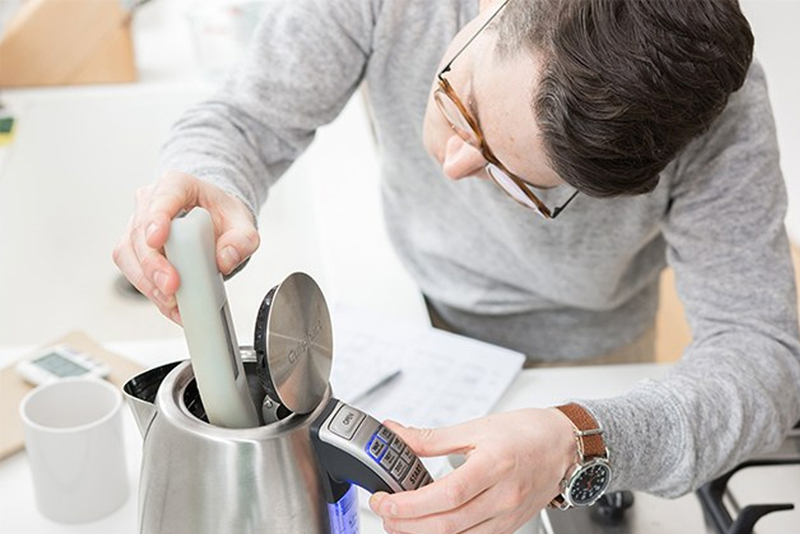 We've spent dozens of hours researching and long-term testing electric kettles. For the fifth year in a row, we think the Cuisinart CPK-17 PerfecTemp Cordless Electric Kettle is the best electric kettle for most people. It's a high-end, variable-temperature model that's ideal for brewing myriad teas, making pour-over coffee, or simply boiling water for instant oatmeal. Thanks to its winning combination of speed, accuracy, and ease of use, it bested all the other electric kettles we tested. The Cuisinart CPK-17 won us over with its consistent performance and easy-to-use interface. In our tests, we found very little variation in the amount of time it took to bring water to a boil, and we were also impressed with its accuracy in holding water at a set temperature. It has six preset temperature choices, each with a dedicated button, as well as buttons to start boiling and to activate the Keep Warm feature. It emits alerts when you press a button and when the water reaches its target temperature, but unlike with some of the other models we tested, those beeps aren't too obnoxious or annoying. The three-year warranty is also quite a bit more generous than the coverage for similarly priced electric kettles. Pour-over coffee lovers will appreciate the precise aim of the Bonavita BV382510V 1.0L Digital Variable Temperature Gooseneck Kettle. This smaller, 1-liter model is lightweight and easy to hold, so your hands won't tire while pouring. Tea lovers will also like its spot-on temperature accuracy: You can set the Bonavita to any temperature between 140 degrees Fahrenheit and 212 °F, so it's ideal for brewing all varieties of tea. This model even has the ability to hold a set temperature for up to an hour, 30 minutes longer than our main pick. For larger households, we recommend the 1.7-liter version of this kettle. We recommend the inexpensive Hamilton Beach 40880 Stainless Steel 1.7 Liter Electric Kettle for anyone who doesn't want to break the bank but still wants a decent kettle. 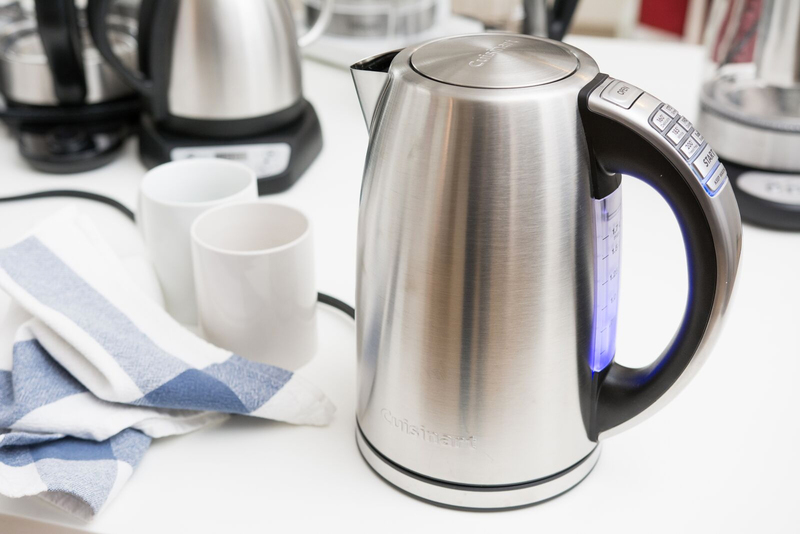 Using this stainless steel model is very straightforward: You switch the tab up on the kettle to boil water, and it shuts off automatically as soon as the cycle is complete. In our tests, the Hamilton Beach 40880 had one of the fastest boil times; the handle also stayed cool after boiling, and the spout didn't dribble when pouring. This kettle has all of the features we look for in a basic model at a bargain price. We talked to a number of experts about what they look for in a kettle, including Tony Gebely of World of Tea; Michelle Rabin, founder of T Ching; Peter F. Goggi, president of the Tea Association of the U.S.A.; and famed tea expert Bruce Richardson. We also looked at highly rated models on Amazon as well as reviews from Cook's Illustrated (subscription required), Good Housekeeping, and Wired. A variable-temperature kettle can heat water to the correct warmth for making delicious coffee or tea at home. Getting a variable-temperature kettle is the key to immediately improving your caffeinated-drink game, whether you're a tea collector or a scale-grinder-dripper coffee nerd. If you're not a coffee or tea aficionado, you may just want a no-frills basic model that only boils water. In either case, an electric kettle also works for people who hate the alarming sound of whistling kettles and want a fast, more automatic path to their morning cup of caffeine. 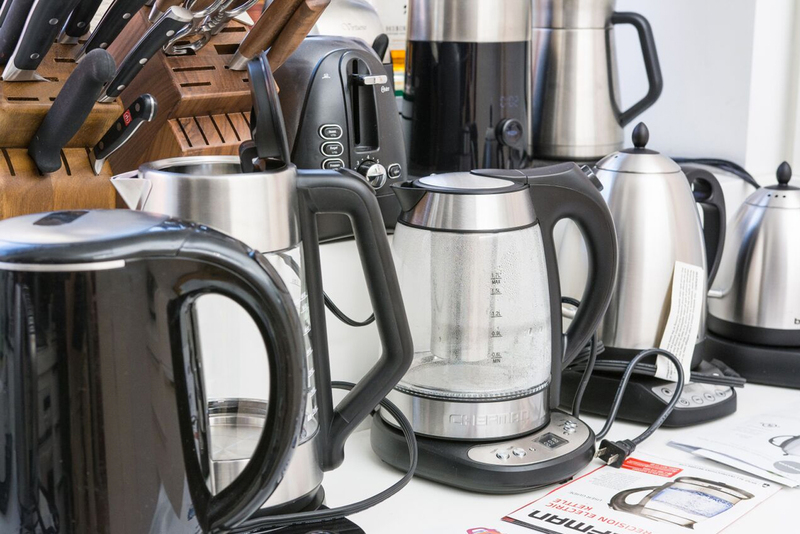 If the entirely plastic electric kettle you already own imparts an unpleasant taste or smell to the heated water, you may want to switch to stainless steel or glass. While these models still contain some small plastic components, they generally don't have as many issues when it comes to producing a plastic taste or smell. To avoid plastic entirely, we'd recommend investing in an old-fashioned all-metal stovetop kettle. In preparing tea, most people just put a kettle on to boil and then pour the resulting hot water over the tea bag, regardless of type or temperature. But the different varieties of tea are meant to be brewed at specific temperatures. 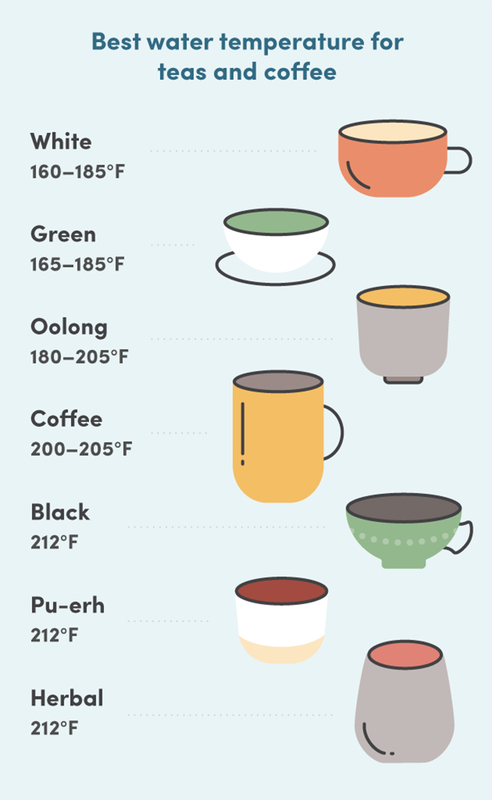 While exact temperatures are up for debate and come down to personal preference (see Wirecutter's suggested water temperatures for teas and coffee below), the general rule is that more delicate leaves require cooler water. So green tea, for example, should steep at a temperature markedly lower than the rolling boil that black tea requires. Coffee aficionados also pay attention to temperatures. The AeroPress system, for instance, suggests using water that is considerably cooler than freshly boiled: 175 to 185 degrees Fahrenheit. Some dripper owners use 195 °F water while others suggest 205 °F, and both of those temperatures fall under the full-boil temp of 212 °F, too. 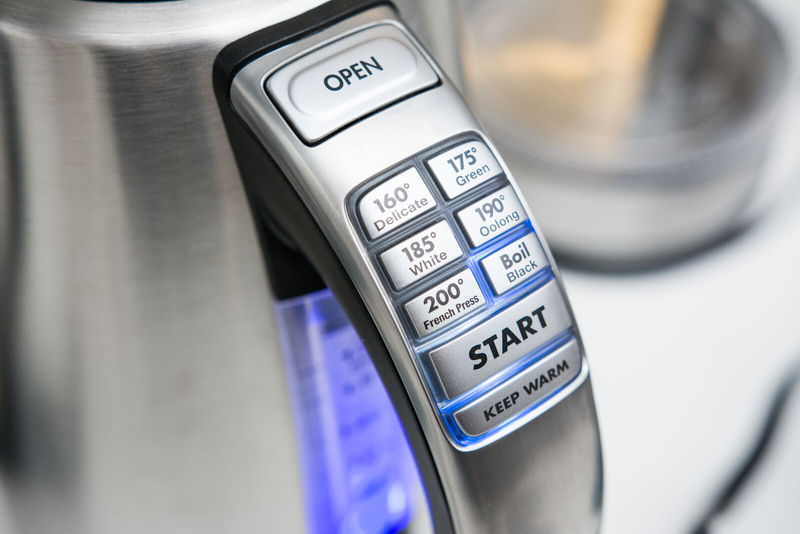 A great electric kettle should have a wide variety of temperature settings to accommodate different types of beverages. Reasonable accuracy at hitting those temperatures is also important, because there's no point in aiming for 200 °F and hitting 212 °F instead. That said, we realize that not everyone is a coffee or tea aficionado, so we also looked at kettles that do not have variable temperature settings and simply boil water. Speed is critical—you don't want to wait forever for your water to come to temperature. 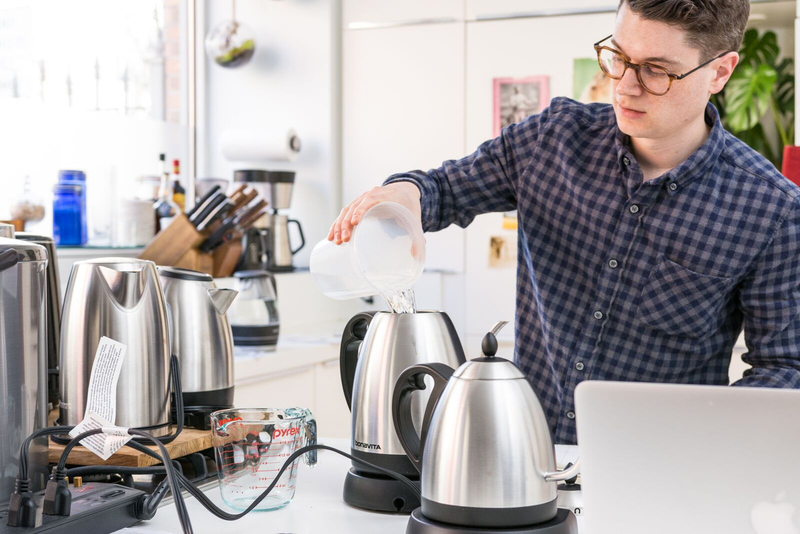 An electric kettle should also be easy to use, have a handle that doesn't get too hot, and feature automatic shutoff so you don't have to worry about forgetting to turn it off. A large mouth for easy cleaning is another plus, but these days the vast majority of electric kettles conceal the heating element, so you no longer have to contend with scale-covered electrical pieces that never get totally clean. All of the kettles we tested for our 2017 update were metal or glass. Some people, including our experts, complain about plastic kettles imparting a funny taste or smell to the water. To minimize the possibility of unpleasant flavors in the water, we didn't test any models made entirely of plastic. All of the models we did test, however, contained some minor plastic elements, such as parts of the lid, a filter, or the water-level window. All of the manufacturers of our picks assured us that the plastic components in their kettles were made from heat-resistant plastics; this means they're less likely to leach by-products into your water at high temperatures, even after repeated boilings over prolonged use. Though glass kettles are less likely to impart off flavors to the water, they are more prone to breakage if dropped. 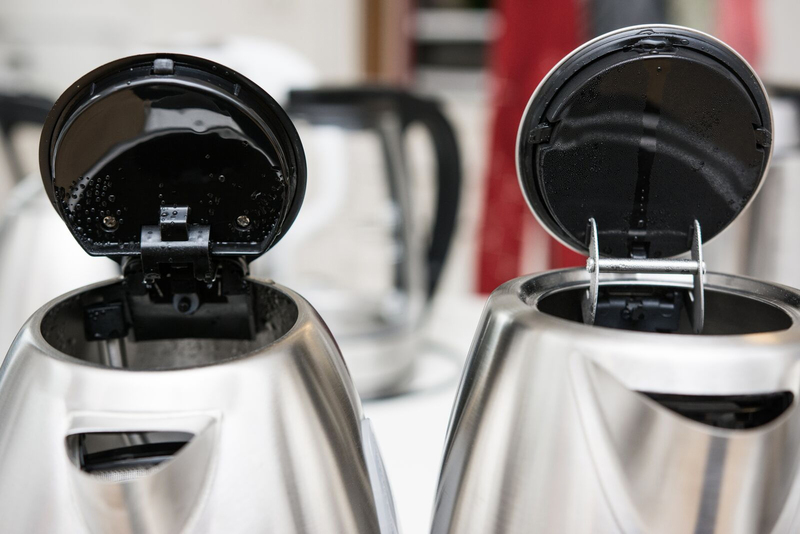 In our experience testing kettles, we've found stainless steel models are more durable. Our top pick for the fifth year in a row is the Cuisinart CPK-17 PerfecTemp Cordless Electric Kettle, thanks to its ease of use, speed, and accuracy. It has an intuitive interface with a keep-warm option that conveniently holds water at a set temperature. The wide handle is comfortable to hold, and the spout doesn't cause water to dribble when pouring. 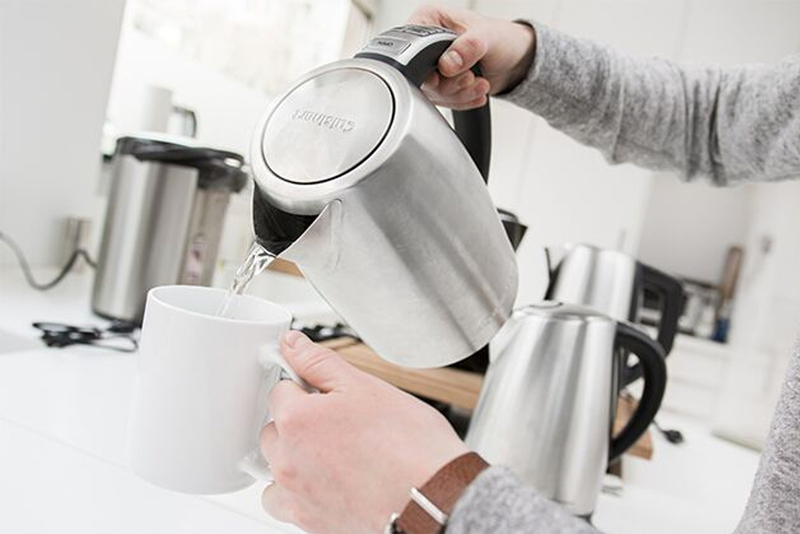 Unlike many of the kettles we tested, it has a simple streamlined design, so it won't be an eyesore if you store it on your kitchen counter. Compared with all the other variable-temperature models we tested, the Cuisinart CPK-17 was the simplest to operate. It offers six preset temperature settings as buttons on the handle (labeled as 160°, 175°, 185°, 190°, 200°, and Boil), along with a Start button and a Keep Warm button. You add the water, select the temperature you want, hit Start, and wait for the kettle to beep when it's done. It then kicks into an automated keep-warm cycle, where it maintains the temperature for up to 30 minutes in case you can't quite make it to the kitchen in time. In our tests the push button on the handle made for easy one-handed lid opening, and the water poured in an even stream without dripping. Aside from its straightforward, easy-to-use design, our testers found the Cuisinart had an extremely consistent boil time. On average, it brought 1 liter of water to a boil in around four minutes. While the CPK-17 wasn't the fastest of the kettles we tested, it was speedier than most. Additionally, the Cuisinart proved to be impressively accurate in our tests: After it held a set temperature of 185 °F for 30 minutes, the water measured just 2 degrees over. The Cuisinart CPK-17 also has all the other features we look for in an electric model, including a removable scale filter for easier cleaning, a concealed heating element that won't get gunked up by mineral deposits, and a 360-degree swivel base so you can grab it from any angle. Its lid is large enough for you to get inside easily for cleaning (just avoid splashing water on the control buttons located on the handle). And while all of these features are fairly standard, the Cuisinart CPK-17 is the only model we tested that offers them all while managing to avoid the glaring flaws that plague its competition. In contrast to the annoying, excessive beeps that were one of the drawbacks of the KitchenAid KEK1722SX kettle (our former runner-up two years ago), the Cuisinart CPK-17 beeps only once when you press a button on the control panel, or several times when it reaches a temperature setting. Our testers liked that temperature alert—it means you don't have to hover over the kettle in eager anticipation. Be mindful, however, that a raucous beeping will occur if the kettle is on and you return it to the base empty. This is the "boil-dry protection" warning, intended to prevent damage to the kettle; just remember to shut it off if it's empty. Since the water-level window allows you to see when it's getting low, we found it easy to avoid this situation. Although the Cuisinart CPK-17 had better accuracy than most of the other kettles we tested (which measured more than 10 degrees off their temperature settings in some cases), we found it wasn't as accurate at hitting lower temperatures, measuring 8 degrees over when we set it to 160 °F. On temperatures of 175 °F and up, it measured only 3 to 4 degrees off, which is pretty accurate. Since this model has a slew of other noteworthy features and has been consistently reliable over four years of long-term testing, we're willing to forgive its minor temperature variances at the lowest setting. We have received recent feedback from some of our readers and have seen other reports of this Cuisinart model breaking down after about a year. Some Amazon customers have reported rusting screws on the interior within a couple of weeks, but this problem is rare and should be covered under warranty. We've also heard complaints that the lids on some Cuisinart CPK-17 units have broken off at the hinge. We haven't experienced these issues ourselves; several people on our staff have owned and used this kettle for years and haven't encountered any problems with it. Most say it has been a workhorse. One of our staffers has used it every day, sometimes up to four or five times a day over the past year, and they reported that it has never broken "or acted up." We will certainly keep an eye on the owner reviews for the CPK-17 to see if a quality-control problem has cropped up, but we continue to stand by our pick. We think the stainless steel Bonavita BV382510V 1.0L Digital Variable Temperature Gooseneck Kettle (a design also available in a larger, 1.7-liter version) represents an excellent compromise between a traditional tea kettle and one better suited for making pour-over coffee (see our guide to the best pour-over coffee gear for more). 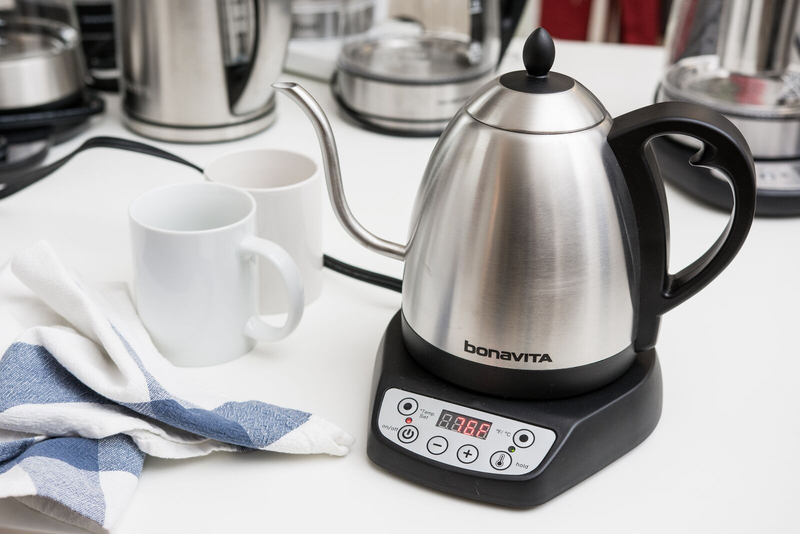 Although this model wasn't the fastest kettle to bring water to a boil, the Bonavita had the most accurate temperature controls among all the models we tested. The long, gooseneck spout provides superior pouring technique, and the interface is easy to use. We also like the looks of this kettle; it's handsome enough for you to keep it on your kitchen counter. 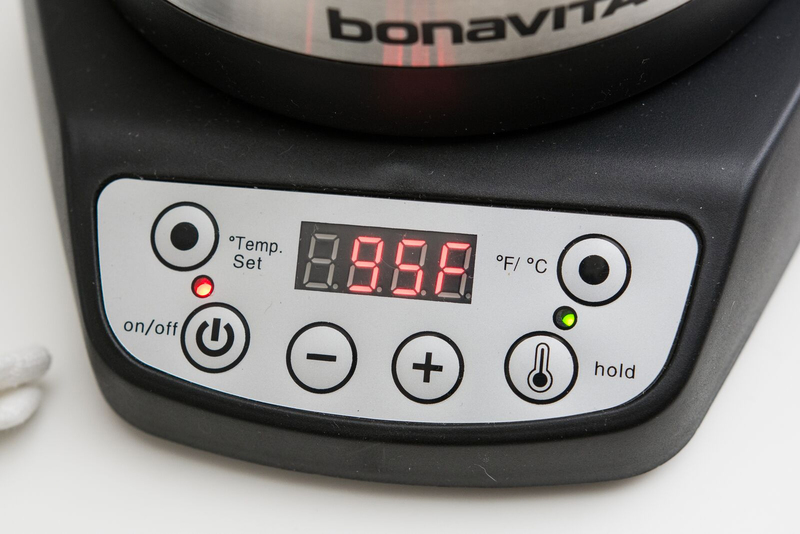 Of all the models we tested, the Bonavita BV382510V had the most precise temperature control, impressively measuring just 1 degree off regardless of the temperature setting. It gives you the freedom to set it in 1-degree increments from 140 °F to 212 °F on an easy-to-read digital display. This model also tracks the water's temperature accurately as it rises or lowers, so you always know how hot it is. A Bonavita representative we spoke with said this model's impeccable accuracy was one of the reasons why it's so popular among baristas. Our testers also praised it for its long neck, which provided excellent pouring technique for pour-over coffee or a single cup of tea. And while the spout wasn't very handy for pouring into a teapot, we think that isn't an issue since this model is attractive enough for you to serve directly from the kettle. It has some minor drawbacks, however. This model took about two and a half minutes longer to boil than our top pick, and it doesn't provide a water-level window for you to see when it's getting low. Unlike our top pick, it lacks a boil setting, so you have to manually enter 212 °F using the plus button. Also, the lid doesn't have a push button and needs to be removed, as on a traditional stovetop kettle. But despite those minor flaws, after over two years of using the Bonavita BV382510V daily, we haven't experienced any issues, and we think it's the best for anyone who will use it for both tea and pour-over coffee. 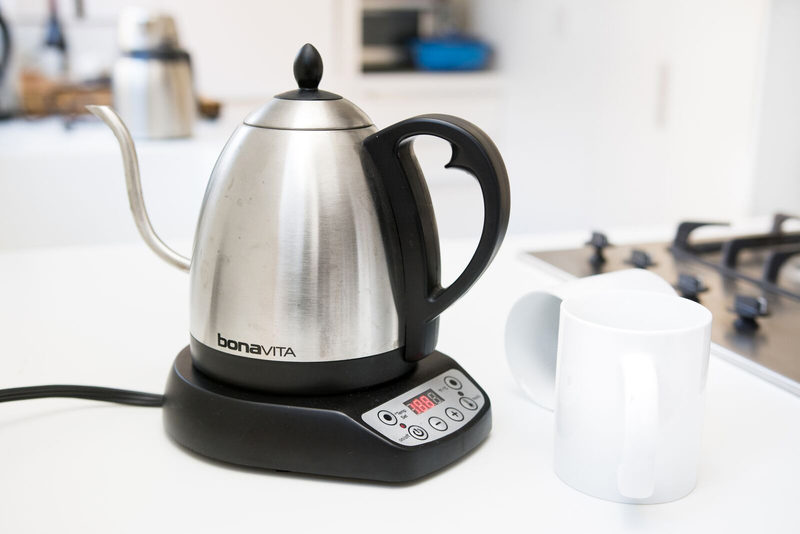 The Bonavita kettle comes with a one-year warranty, which is skimpy next to the three-year warranty of our top pick. 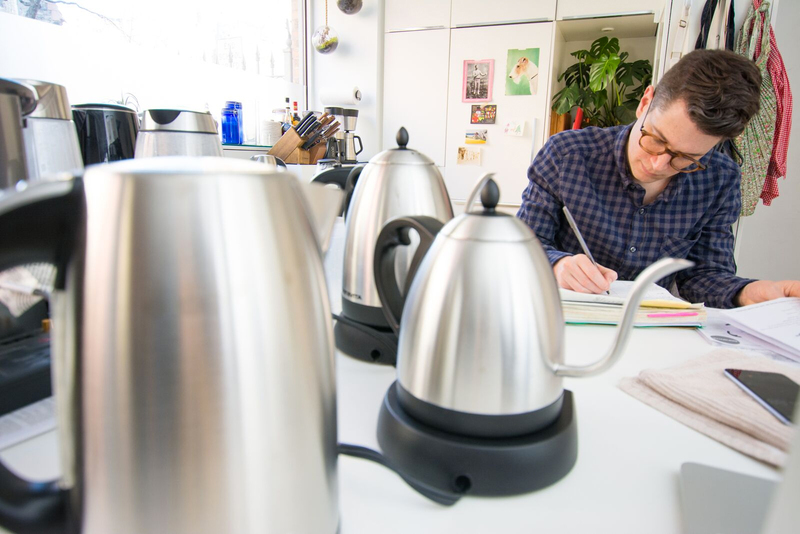 Members of the Wirecutter staff, however, have owned this kettle for over four years and say it's still working like new. You should contact Bonavita if you encounter problems or need a replacement. We recommend the Hamilton Beach 40880 Stainless Steel 1.7 Liter Electric Kettle for anyone who wants an affordably priced basic model that quickly brings water to a boil. This kettle lacks the bells and whistles of our other picks—it doesn't have preset temperature controls, or a keep-warm setting—but it does have all the other features we look for in a decent kettle. Most important, perhaps, its handle is easy to hold, and the spout doesn't cause water to drip when pouring. Our testers were impressed with the speed of this kettle, which was on a par with our main pick in boiling time (about four minutes). This Hamilton Beach model is very simple to operate: You flick the tab up on the base of the handle, and the kettle begins heating the water. The red light illuminates on the base once the boiling cycle begins, so you always know that it's on. Once the water reaches a rolling boil, the kettle automatically shuts off, so you don't have to worry about turning it off manually. In our tests, the spout on the Hamilton Beach 40880 didn't dribble water when pouring, and the wide handle was comfortable to hold. 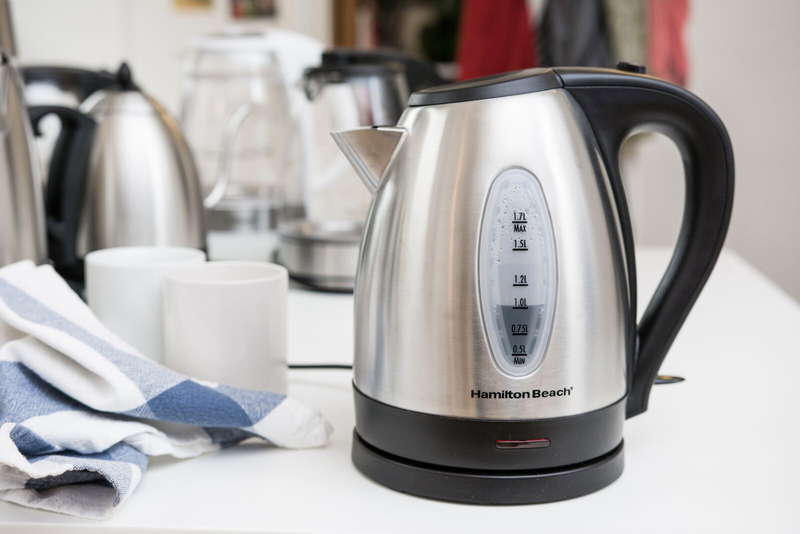 Unlike some models in our test group that require you to open the lid manually, such as the Hamilton Beach 40865 1.7 Liter Glass Electric Kettle, the 40880 conveniently opens with a push of a button located at the top of the handle. This model also boasts two water-level windows, a design that allows you to see how full the kettle is regardless of which way you place it on the base. The plastic hinges on the Hamilton Beach 40880's lid are its only significant drawback. Other models, such as our top pick, the Cuisinart CPK-17, have metal hinges that seem more durable. Our testers liked that this model doesn't beep, unlike our previous budget pick, the Chefman RJ11-17-GP, which was plagued by excessive beeping. To minimize the amount of deposit buildup in your kettle, always empty it after you use it. You'll still need to decalcify your kettle from time to time, though the frequency depends on the hardness of your water. Check the manual for the manufacturer's specific instructions on descaling; otherwise, you can fill the kettle with 1 cup of white vinegar and 3 cups of water, heat it to a boil, turn it off, and allow it to stand overnight. Alternatively, half a teaspoon of cream of tartar with half a kettle of water should also work. After emptying the kettle, refill it with water only, bring it to a boil, and drain; repeat twice more. We didn't like the lid on the Hamilton Beach 40865 1.7 Liter Glass Electric Kettle, which you have to open manually by squeezing two release buttons. The lid also doesn't stay propped open, so filling this kettle with water was more difficult in our tests. We were disappointed to see the steep price of the Breville BKE820XL IQ Kettle, as it doesn't have any features to differentiate it from the Cuisinart CPK-17 and make it worth the extra cash. We also looked at the glass Breville IQ Kettle Pure, but we preferred the stainless steel model. In our tests the Chef'sChoice SmartKettle 688 was very precise, but it was incredibly slow at bringing water to a boil. Its customer ratings have also dropped on Amazon due to various malfunctions. The Chef'sChoice Cordless Electric Kettle 681, a previous budget pick, had one of the fastest boiling times of all the models we tested, but Amazon reviews for this model have dipped considerably due to leaks or auto-off function failures. The Chef'sChoice Cordless Electric Glass Kettle 679 is too expensive for a basic boiler. We dismissed this model, since you can find a slew of other kettles in this range that offer more features at a lower price. We also looked at the Chef'sChoice 691/692, but that version is also a bit pricey for a basic kettle. Although the Melitta 1.7-Liter Cordless Kettle has a temperature control knob, it doesn't indicate specific temperatures. (The labeling is by tea type: "oolong" and so on.) We found this design frustrating, especially when trying to heat the water to a specific temperature for pour-over coffee. This model also has availability issues on Amazon. At the time we checked, the Bonavita BV382517V 1.7 Liter Variable Temperature Kettle had notably poor reviews on Amazon, apparently at least in part due to the handle overheating. We also came across a Pino digital kettle that Cook's Illustrated liked, but the Amazon reviews were poor at the time, and it didn't seem to be widely available. The Adagio Teas utiliTEA Variable Temperature Electric Kettle has only a 0.9-liter capacity. On top of that, in testing we weren't fans of its heat control, which lacked temperature markers. The Hario EVKB-80U-HSV V60 Power Kettle Buono has an appealing design but doesn't offer anything more than the less expensive Bonavita gooseneck model. The Hario also lacks variable-temperature controls. Two glass models, the Salton GK1429 Kettle & Tea Steeper and the SMAL WK-0816, have temperature readings only in Celsius, which isn't practical for most American households. 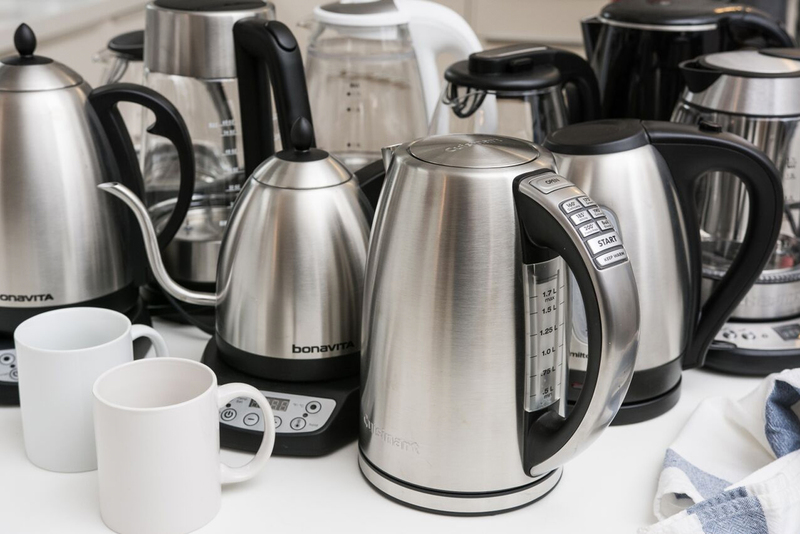 You can find myriad models lacking temperature controls, such as the Breville SK500XL Ikon Electric Kettle, that cost more than what they're worth. And most cheaper models that have some form of temperature control (like the T-fal BF6138 and the Hamilton Beach K6080A) are almost entirely made of plastic; some reviews indicate that these plastic models leave the water tasting and smelling like plastic. Some other models we encountered, such as the Breville BTM800XL One-Touch Tea Maker, were exorbitantly priced. More than $200 is too much to spend on a kettle, especially if it has only a one-year warranty. Even the KitchenAid KEK1522CA Pro Line Series Electric Kettle doesn't have any more to offer than our top pick, which is about half the price currently.